This was my third SI class with Alex Nieuwland and Chris Upchurch (CRG in March and 0-5 Feet Pistol Gunfighting in April). The big difference this time around was actually getting to use my sights, in particular my RMR. We started out by going through the rules of firearm/range safety, then went through the fundamentals of pistol marksmanship. We started with dry fire as Chris and Alex critiqued our stance, grip, and trigger pull, looking for any shift in the pistol as we pulled the trigger. As we started live fire, after the string of fire was completed at each distance, both instructors would review our targets and discuss any variances or fliers to determine where we were experiencing a breakdown in our mechanics. Adjustments were suggested and incorporated into the next round of fire at the next distance. While we were firing 2 COM and one face shot per string of fire, I noticed that when firing at COM, I had more spread between my aimed shots than I was happy with. 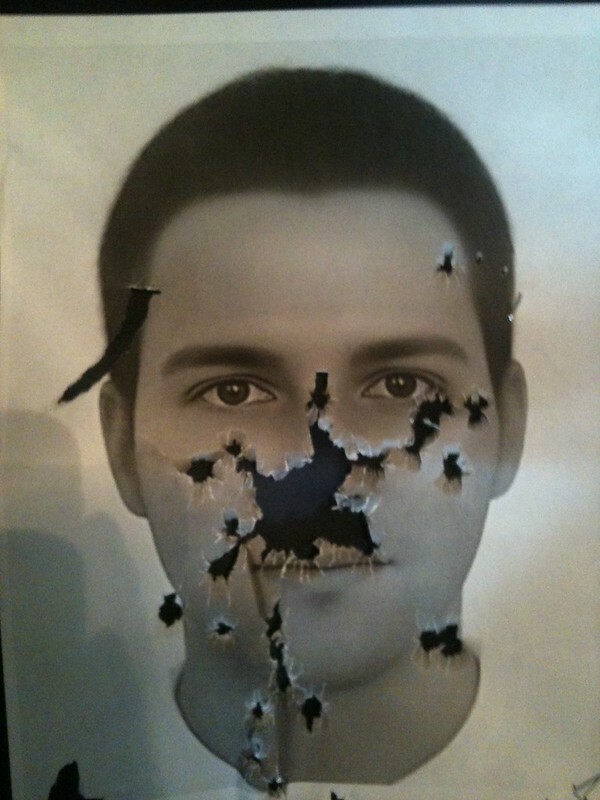 Oddly enough, I found that I was able to keep nearly all of the face shots between the upper lip and bridge of the targets nose. This did spread out to the cheekbones and eye sockets as we added more distance. I also noticed that, when we had cloud cover I was able to make more precise shots, but when there was a break in the clouds I had to deal with significantly more blooming around the dot of my dual illumination RMR (Chris suggested possibly adding a strip of tape to the fiber optics to reduce light absorption. This is something I will definitely be doing in the near future. After stretching back to approximately 30 yards from a normal shooting stance, we began working from other positions including kneeling, supported kneeling (with support both below and beside), prone, supported prone, and a couple of modified supine shooting positions (Keith and Creedmore). Alex and then set out some clay pigeons and we backed up as far as we could across the diagonal of the range, giving us between 35-40 yards (I don't remember what the range was precisely). Each student then got to choose a shooting position and attempt to break a clay pigeon while the instructors walked their fire in. I chose supported prone as that seemed to be the most comfortable shooting position for me. In my mind I went through the fundamentals, as well as the guidance I've absorbed from my dogeared copy of John Plaster's Ultimate Sniper. 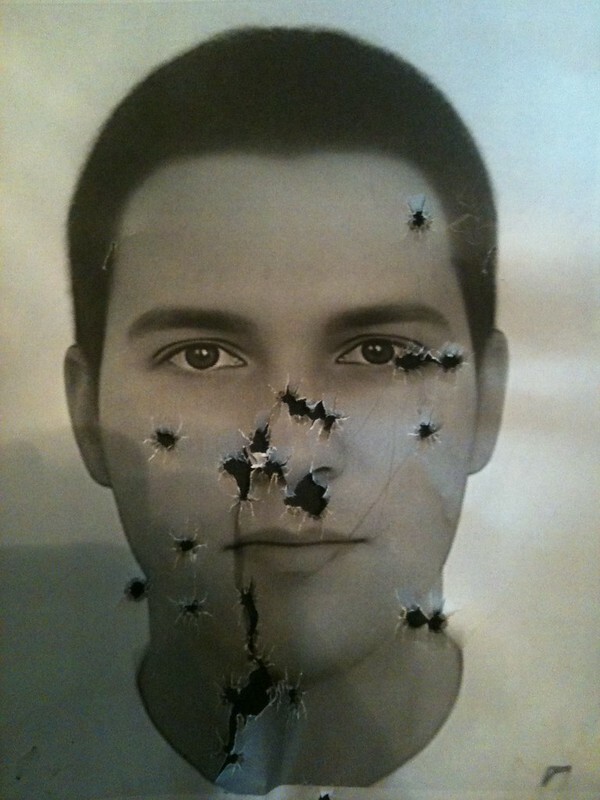 I selected a clay pigeon, set my dot on it, exhaled, paused, and squeezed the trigger, knocking the center out of it. The RMR made it way too easy. Figuring I'd best not press my luck, I hopped up and called it done. After we had killed our fill of clay pigeons, we walked back to the 10 yard line and ran a couple of mags into the new face targets that had been hung. I probably shot a little faster than I should have, but still only had one out of 35 rounds that was a grazing shot. The rest were in the face and neck. Overall, I enjoyed this class as much as CRG and 0-5. A big plus was not getting shot with airsoft, though Chris offered to rectify that for me. I now have more tools in the tool box and a little more flavor to add to dry fire practice. It was good to train with you again! Thanks for posting your review. Chris and I both thought this class went very well, in no small part thanks to the caliber of the students that attended. As Alex said, we had a great group of students in this class. Everybody came in with a good solid base and did a great job building on it through the day. This certainly made it a fun class for the instructors, and I hope it was for the students as well. Thanks guys! Last edited by Chris Upchurch; 05-21-2012 at 09:06 PM. This was my second class with Alex and Chris and as expected it was excellent. All of my training to this point had been close range scenarios so I was eager to get some longer range practice. What I enjoy most about Suarez classes is that they cater to your individual needs while maintaining a schedule. I was able to identify my individual needs and various areas which I need to improve upon. This marks my fifth Suarez International class and I must say I have been truly impressed with all SI Instructors which I have had the pleasure of training with. As you will quickly learn in this course when the range of a threat increases your marksmanship is vital. All scenarios presented where very realistic and will enhance your ability. Thank you to Chris and Alex for your expert instruction and patience throughout the day and I am looking forward to the next class with you in the near future. Thanks Barrett. Glad you enjoyed the class. If all you're goin' on is my confession, forget it, I'm simply not credible.